Over and over again the experts say that the most popular art blogs are the ones that provide content, not just your art. For some artists this seems like backwards thinking. "Why would I create an art blog that isn't about my art?" I think that's where the mistake is being made. You can create good content and show your art at the same time. Its all a matter of balance. Balancing your personal content with more generalized content is the key. Consider that when you look at an artists portfolio that all you see is that artists work. That's the purpose of a portfolio. There is little else. And while you might be a fan of that artist it can grow boring pretty fast. And unless that artist is producing a prodigious amount of work on a weekly basis, it probably doesn't even get updated all that often. People lose interest. The goal of any good art blog should be to make people want to come back over and over again. The more they visit the more they see your work also. Note that articles of interest outweighs my own work. In fact articles of interest are the center point of my site. My own personal work is located on one side of the blog. Content of interest dominates the center of the blog. But here is the key. The content is still mostly my own (including this article your reading now). These articles are of interest to other artists regarding a great many subjects but written from a personal point of view of another artist. They aren't written by a professional media savvy writer. There are grammatical mistakes, the occasional misspelling and biases and opinions that come from anyone writing in the first person. Its personal and it generates a following because people like to see mistakes. They like to know the writer is human. They like to know they aren't the only artists out there struggling to stay afloat each day. Its personal. And often the articles relate back to work I do. So indirectly I am still promoting my own work in a round about way. But along with that self promotion comes a genuine interest in teaching and promoting other artists. You'll note that I do not consider promoting other artists to be part of that small 5% promotional audience. This is because when I promote another artist I am not promoting a professional site. I am personally promoting and endorsing an artist that I feel should get as much as exposure as possible. Again though there is a very strategic reason for promoting other artists. It not only serves a good purpose by giving them an additional audience but its also bringing their audience to me. If an artist has 100 dedicated followers, that's 100 more people who might potentially come to my blog. What happens when they come to my blog? They not only find interesting content but they inevitably see my own work. So lets talk about the way I have my own work set up. This is much more strategic than just tossing up a portfolio with pics. I have two primary categories. The first is work I've completed. Each page contains information about the piece that a potential buyer might want to know and has a direct link to buy the piece off the site. But the second is in my opinion more important. Its a Works in Progress section where both artists and fans can follow the building of specific pieces of art. This allows me to begin promoting a piece of art at its inception, not its conclusion. The added benefits of promoting a piece of art when its still in the conceptual phase and then going step by step through the creation process creates a more personal bond with the viewer. A buyer can see the piece become real before their very eyes and allows me the artist through the various social networks to promote the piece over and over again. If you can involve a potential buyer at the emotional level then you double your chances of the piece being sold. The hardest part about selling art work online is that the buyer only see's one or two photos of the finished work. This way it allows them to see every aspect of the piece and become emotionally involved in the art. It becomes theirs before they even buy it. Promoting ones art isn't just about putting out there. Its so much more. Many artists believe in the theory that the less said about a piece of art the better. That if you talk about it, it loses its mystique. I can see their point and in some cases that might work, but I don't think we should be afraid of talking about our art and why we created it or the steps involved in getting to the end product. I think it makes our art more real and more interesting. So lets talk now about that last 5% that involves promotion. You will note that I have no direct advertising on my site. I am a firm believer that a site cluttered with advertising banners for Russian Wives and the newest hokum cures for Diabetes makes the site look trashy and totally loses the message. Yes I know that advertising is a form of revenue for your site. But face it, if your an artist with a blog, the $1.26 you make monthly from those banner ad programs is both a waste of time and a detriment to your site. You simply look trashy! 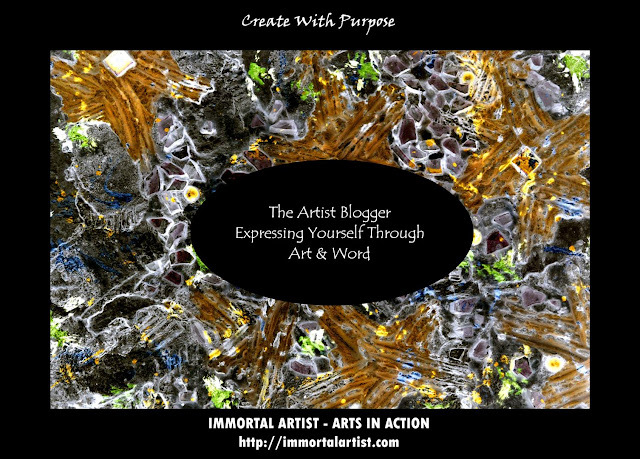 I firmly believe that everything on my blog must relate directly or indirectly back to the art world. They few sites I might post an advertisement for is because I believe that site has something to offer other artists. I had a man recently ask me to promote his modeling business. I thought about it and for a few weeks I even posted a link on my "top picks" list and then I removed it. While an argument can be made that modeling is a form of art, I felt it was just too far of a stretch and I made a firm rule not to do so again. It is crucial that you stick to your subject content in ANYTHING that you may place on your blog or if you the subject is not directly related you find a way to link it in idea back to art. I say this because as a transdisciplinary artist I can go pretty far afield on some subjects. But I use those subjects as fuel for my art. But I try very hard to find a way to connect the dots back to art. One last thing on promoting other sites. I have a list of Top Pick art sites. These are sites I personally believe in and which I find create admirable content for artists. But there is one other reason I do it. Linking other sites to your own site generates more traffic and raises your SEO score higher, or so I am to understand. So far it seems to work for me even if the site I am promoting isn't cross promoting back. I see a slight boost in traffic each time I add a site to the list. A few other tips. Keep your content short. There is no need to write 10 pages. People just don't have the attention span for it. Stay to the point. You can always write another article in relationship later. Use photos as often as possible. A site filled with just text loses us artsy types. We like to see pretty pictures. Promote your blog constantly on the social networks. Write something new, post it on Twitter, Facebook, Google+ etc immediately. Keep it clean. Don't clutter it up so much that people get lost in it. Don't change its design every other day. Establish a nice look and leave it alone for awhile. Lastly watch your stats. Be a number person. Keep track of how many are entering your site and which articles particularly get attention. Now I don't want you to get the wrong impression. Because I am using my own site as the example here does not mean I think that its perfection. Its far from it. But I read a lot of articles on blog promotion and I try to emulate the steps that the professionals say work along with my own attempts to try a few new and unique ideas. I wrote my first blog article on October 23rd of last year. I remember my first few months I was ecstatic to even get 10 views a day. But slowly things began to change. Now I average 500 views a day with a few days as high as 1,400. That says to me at least people are looking. Remember, your an artist. Make your site beautiful, pleasing to the eye, artistic in the content and you can't go wrong.